Are you thinking about getting a new car? Maybe the old one has given up the ghost and it’s time for an upgrade? If a new set of wheels is on the cards there lots of options to consider, buy outright, buy on finance, new or second-hand. Another factor in the equation is your business. 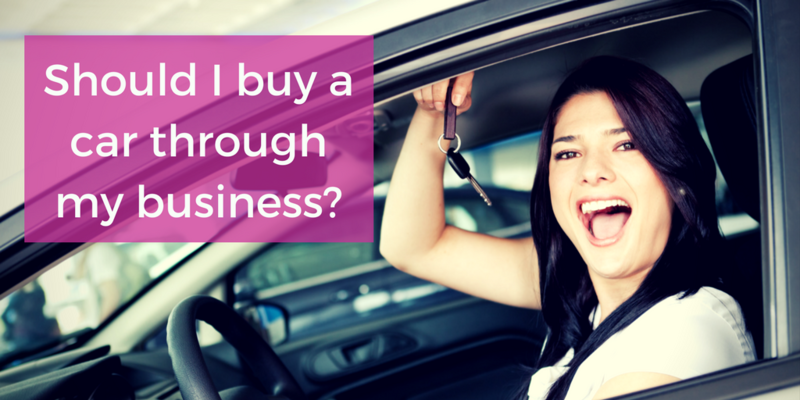 If you need to use your car for work, is it a better option to buy the car through your business? Are there tax benefits? Will it save you money? Whether it’s a good idea to have your car through your business depends on two main factors, your business structure and the amount of business versus personal use. It’s a complex decision and there’s no single right answer. There are a number of different areas to consider which may be different for each person and each business. If you buy a car through your business it’s counted as a business fixed asset, a type of plant and machinery. This means you can claim capital allowances on its purchase value to reduce the taxable profit in your tax return. However, the capital allowances for cars are a lot less generous than those for other types of plant and machinery. For a new computer, the whole value can be claimed in the year of purchase (via annual investment allowance). Alternatively it can be added to the main rate pool and then 18% of the remaining value is claimed against the profit each year. Cars are judged on the amount of CO2 emissions . They will either fall into the 18% main rate pool or more frequently into the special rate pool, getting only 8% of the remaining value against the taxable profit each year. In terms of capital allowances a commercial vehicle, such as a van, is a much better option as this does qualify for annual investment allowance, so you can have the whole value of the van against the taxable profit in the year that you buy it. If there’s an element of personal use, then this needs to deducted from the capital allowances e.g. if you had a car worth £10,000 in the main rate pool, but used it for personal journeys for 50% of the time, then the capital allowances in the first year would not be £1,800 (18%) but £900 (50% of £1,800). You can still claim capital allowances even if you bought the vehicle on finance as long as the business does (or will) actually own it. There are no capital allowances on hire or lease vehicles. There is a flip side to the tax benefits of capital allowances. If you do buy a vehicle through the business, there might be balancing charge which increase your tax bill when you come to sell. This is more likely for a commercial vehicle (rather than a car) where the full value of capital allowances have been claimed. 1. It must be a car that has never had any private use, (known as an excepted car), for example a brand new car or previously a pool car / lease car. 2. It will be used exclusively for the purposes of the business and is not available for any private use, for example an company pool car. Personal use includes commuting to and from work, so even if you only use the car to get to work and back you can’t claim the VAT. Even if there is no actual private use, if the car is potentially available for private use then it fails the test. The only cars which are likely to pass the test are those which are parked permanently on business premises (not outside someone’s home) and are only used for business journeys. Ideally if the business is a limited company, the employee contract should specify that they should not make personal use of the company car. As with capital allowances, the VAT situation is less restrictive for commercial vehicles such as trucks and vans. The truck still has to only be used for the business, but there isn’t the same issue about “available for personal use”. You could park your work truck on your drive and as long as you were only using it for business, you could recover the full VAT on the purchase. It could also be a second hand vehicle as long as the sales invoices showed VAT on the purchase. If you did want to make some personal journeys in your company van, you could still recover VAT on the purchase, but not all of it. You would need to deduct a percentage to represent the personal use element. Remember, this only applies to VAT on the purchase of commercial vehicles, not to cars. It’s not all bad news for cars however. Even if you can’t claim VAT on the purchase, you can recover the VAT on the business related running costs such as fuel, repairs etc. Again if there is an element of personal use than an appropriate deduction should be made. If you decide to use the mileage method for your motor costs, you can claim VAT on the fuel element of the mileage. HMRC’s Advisory fuel rate is based on engine size and fuel type and is updated every quarter. There are some differences in what you can claim for motor expenses depending on whether you run your business as a sole trader / partnership or through a limited company. This article gives more detail (claiming for business motor expenses). There is no particular difference between a car and a commercial vehicle in terms of claiming for the running costs or mileage. Benefits in Kind can be an important consideration if you operate through a limited company as a company director is considered to be an employee of the business. They do not apply to sole traders or partnerships (but would apply to any payroll employees that you have). A limited company is a separate legal entity to its shareholders and/or directors. If you buy a vehicle through your limited company, then the vehicle does not belong to you, it belongs to the company as a “company” vehicle. This does not apply to a sole trader or partnership business as you and the business are the same legal entity. If you as an employee of the company make personal use of a company vehicle then this is classed as a benefit in kind which is liable for tax and NIC. The amount of benefit for a car varies depending on the particular make, model and age. It’s not just related to the cost of the car but also to the fuel type and level of CO2 emissions. HMRC have a car benefits calculator that you can use. A genuine pool car, fulfilling similar conditions to those for VAT would not cause a benefit in kind for the employees using it. For company vans the situation is more straightforward as there is a standard benefit for all types of van. This is currently £3,230 for use of the van and £610 for fuel for private journeys. For van and fuel at the basic rate tax you would be looking at an extra £768 in tax. There is also a cost to the company. Whether it’s a company car or a company van there is Class 1A (Employers) National Insurance to pay at 13.8% on the value of the benefit. Benefits in kind need to be reported via the company payroll on the P11D. What about leasing a car? For a lease car there are no capital allowances available because you don’t own the vehicle. You can claim the lease costs as an expense of the business. You can also claim 50% of the VAT on the lease payments. Unless the vehicle is only going to be used for business, you probably need to think twice. Any personal use of company vehicles will result in a benefit in kind and extra tax / NIC for both the driver and the company. If you do need a vehicle for 100% business use, then a van or commercial vehicle is often a better option than a car. You can claim 100% of the value against your taxable profits in the Corporation tax return (annual investment allowance) and if you are VAT registered you may be able to recover VAT on the purchase. The benefits in kind are also generally lower for commercial vehicles than for cars. It’s not generally worth bringing a car into the business unless it will be a genuine pool car. It’s better to track business mileage and claim 45p per mile. You can also claim VAT on the fuel element of these journeys if you are VAT registered. There is no risk of benefits in kind for sole traders so overall it’s easier to bring vehicles into the business. Cars receive lower capital allowances and you are also unlikely to be able to recover VAT on the purchase. However, if you don’t want a commercial vehicle and your personal use element is going to be low, then a car could be worthwhile. Vans receive more generous capital allowances and it’s easier to recover VAT on the purchase. If a commercial vehicle is a good fit for your business then it’s certainly the more tax-efficient option. If you are trying to decide whether to buy a vehicle through the company and perhaps what type of vehicle to buy, then you have a lot of different factors to consider. You’ll have to weigh up which elements apply to your personal circumstances, considering your business structure, whether you are VAT registered, the amount of personal use, whether there is a real business need and how long you intend to keep the vehicle. Another less objective consideration is the “hassle factor”. HMRC expect full record keeping, so having a business vehicle comes with the requirement to save all the necessary documents and record all the relevant expenses. There is time and effort involved with this and if there’s going to be a lot of personal use, it may just be easier to record and charge the business miles. And after all that, it’s probably still as clear as mud. Through the business or personal? Dream car or maybe dream van? What’s your decision……?